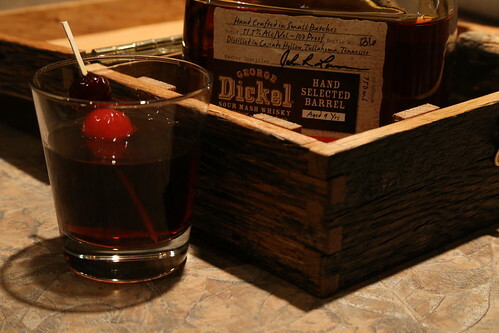 As previously mentioned, I was selected to be part of the Dickel Dozen blogger program. A few weeks back they sent a bottle of Dickel Barrel Program Tennessee Whisky my way along with some challenges. I’ve been responding to their challenges (more on that later) and, more importantly, drinking the whisky and making some great cocktails. So, let’s get to the important stuff! The color of this whisky begins offering hints to its boldness before you even uncork the bottle. The rich cedar/mahogany color speaks to the barrel aging and charcoal mellowing. The aroma is complex with notes of vanilla and fruitcake (think spice, fruit and caramel) and subtle hints of oak and corn coming through. Given that Tennessee Whisky and Bourbon are both corn based it seems logical that you’d get some corn coming through. But I can’t say that I’ve noticed it much in other whiskies. I really enjoyed its presence here. That corn aroma brought me back to what and where this whisky comes from. The flavor is bold. This is not a whisky for whiskey newbies or folks who are only so-so on it. On the other hand, that’s a great thing for people who love whisky. Like this guy. The flavor brings more of the vanilla, caramel and fruitcake flavors to the front with the oak and corn sticking around, but in a supporting role. Despite the boldness, this whisky remains smooth and rich. There is light spiciness from the rye (8% of the mash bill) which works really well with the deep fruit flavors. The finish on this whisky is long, with a pleasant warmth in your throat and reminders of the fruitiness floating around for quite a while. I could drink glass after glass of the Dickel Barrel Program Whisky neat but, hey, I make cocktails. So how does it stand up to three of my favorite classics? Like a champ! 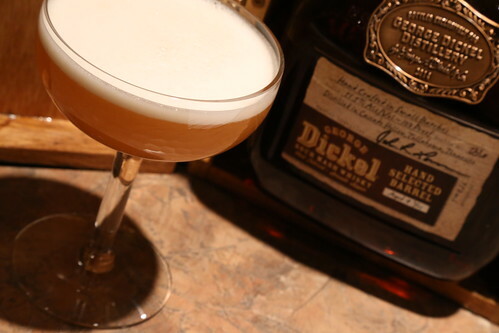 Dickel Barrel Program Whisky Sour – Oh man, this drink reminded me why I like the classic whiskey sour so much. The cocktail is smooth, crisp, refreshing and alarmingly easy to drink. Definitely make sure you’re including the egg white and use a touch less sugar. The complexity of the Dickel pairs really well with the sourness of the lemon and the egg white smooths it all out. 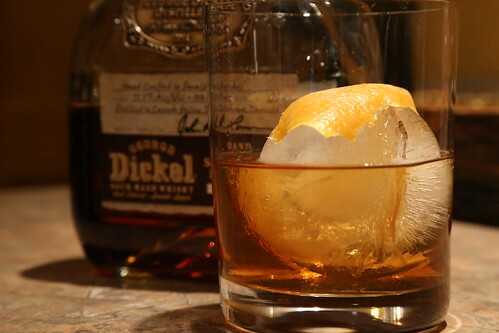 Dickel Barrel Program Old Fashioned – My notes sum it up perfectly, “Bold but smooth”. This is another one where I’d cut down on the sugar you typically use. The inherent sweetness of the whisky come make up for the decreased sugar. I found 2 tsp of simple syrup was a bit too sweet for me, but a touch more Dickel sorted that out. The subtle smokiness of this whisky really came out in the Old Fashioned and worked great with the orange. As with the others, this is a cocktail I can (and have) envisioned myself enjoying much more quickly than planned. I’m finding after these few weeks of sampling that Dickel Barrel Program Whisky has an abnormally short life span when in my house. Could be the altitude, but I’m guessing not. Cheers, friends. May there be whisky in your glass and love in your heart. For over 250 years Berentzen has been making distilled spirits and specifically apple and other fruit liqueurs. Bushel and Barrel is the marriage of their long experience making apple liqueur with the years of tradition and flavor of Kentucky Bourbon. The result is a apple bourbon liqueur clocking in at 30% ABV. The color is a light honey/amber. The nose is where it really starts to come alive, though. The aroma is primarily crisp apple with the subtle notes of bourbon – caramel, vanilla and spice – rounding out the profile. The flavor follows what the aroma started and with less sweetness than I expected. This liqueur is truly not cloying like so many are. 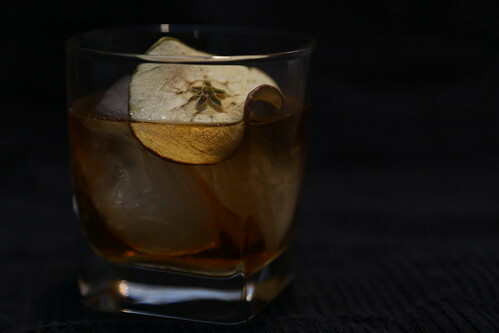 The whiskey adds back notes but the apple is really the star here. I have to add that the apple flavor in Bushel and Barrel is more natural than I’ve found with other apple liqueurs. I think it would make a really interesting, slightly more “grown up”, Apple Martini. For me, Bushel and Barrel is best when mixed 1:1 with a nice high-rye bourbon or straight rye. Something with some spice to play off the sweet apple flavors. I’ve been adding a dash of bitters and making a Bushel and Barrel Old Fashioned that is very tasty and perfect for the fall.